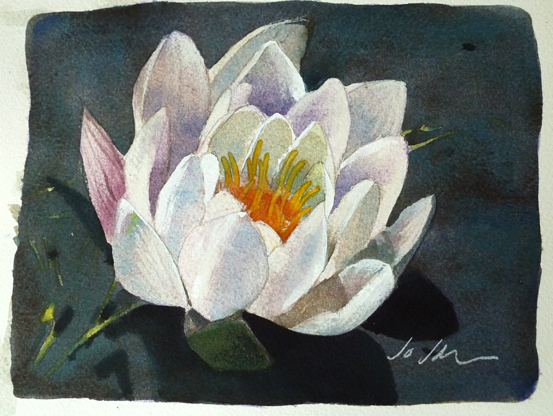 I’ve spent a very enjoyable couple of days on & off, painting this beautiful lily that is gracing our garden pond at the moment. This is a mixed media painting – watercolour, white chalk and white gouache paint. I’m afraid the delicate, lucid tones of the stamens eluded me! Which points up the fact that Art only imitates nature, it can never portray accurately the amazing delicacy and subtle nuances of light that we see with our eyes. As Picasso famously said: “Art is a lie which makes us understand the truth.” in other words my painting, or anyone else’s for that matter, can only be an approximation; we have to find an equivalent in paint or whatever medium we work in, that will at best enable us to mimic on paper or canvas the effect of light .